I am leaving Fitzwilliam College of Cambridge University on Dec. 12, 5 pm, to Heathrow T5, in order to catch a flight departing at 9 pm. What is the fastest and most reliable transportation? Taxi? You've more choices. My son lives in the new NW Development, and I've looked at this issue for my own transport. The National Express website says that more runs are offered to LHR T2/T3 than to LHR T5, and the LHR website says a traveler can easily transfer from T2/T3 to T5 on free LHR shuttle tains. I would not recommend the coach service, since, at that time of day, a coach can easily take 30–45 minutes just to get out of Cambridge (i.e. : before reaching the motorway). A taxi all the way to the airport is an option, and would somewhat avoid the worst of the traffic in Cambridge (since Fitzwilliam is on the same side of Cambridge as the motorway). But, based on my own experience driving on the motorways themselves (both M11 and M25), they are likely to be congested (whenever I have driven the section of the M25 between Watford and Heathrow, there have been lower speed limits in place), so I suspect that a taxi would not be fastest. 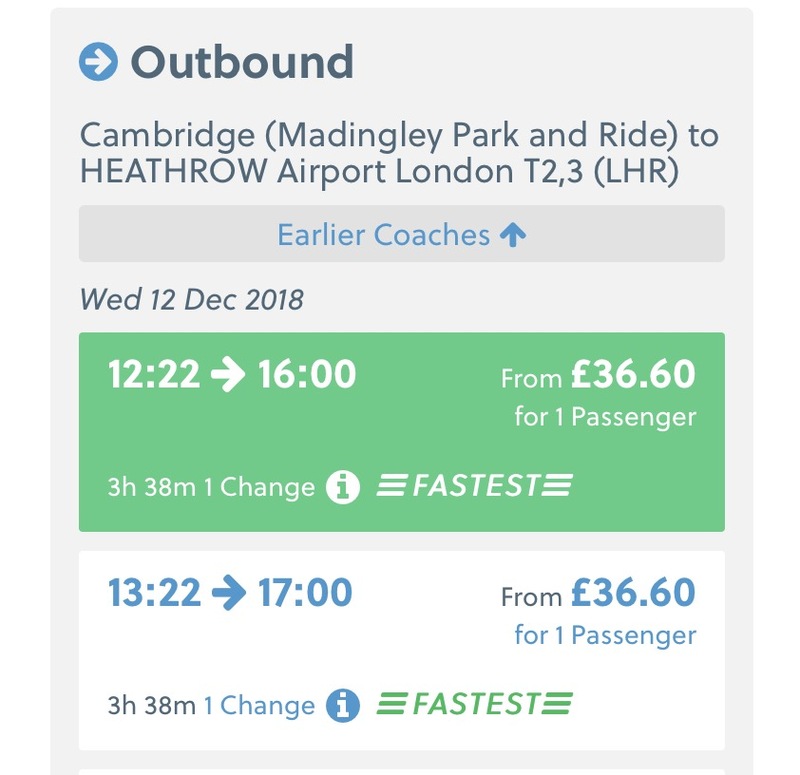 So, your best bet is to travel by train, although getting to the principal railway station in Cambridge (CBG) would, unfortunately, entail traversing the city centre (as would getting to the coach station, by the way). Firstly, note that the University of Cambridge is split over several sites across the city - it'll be important while planning your journey to ensure that you specify which faculty/college you'll be travelling from - in this case Fitzwilliam college. There are three main potential routes, bus, taxi and train. The main railway station is some way out of town, on the opposite side to Fitzwilliam College, and at that time of the evening it will not be a quick journey to get there by bus, foot or taxi. If you manage to get the train at 17:43, you can be at Terminal 5 by 19:50 with a change from the train to the Piccadily line tube at Kings Cross (travel via the Heathrow Express may shave a few minutes off the time, but not much). 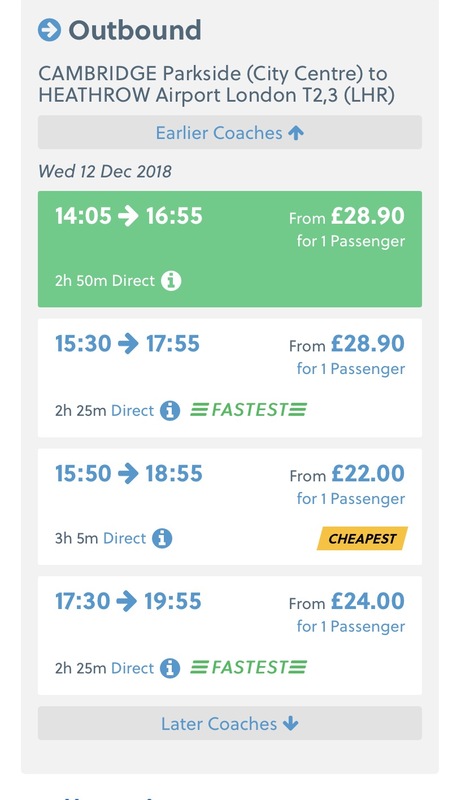 There are frequent trains every 10 minutes or so at that time of day to London, so the risk of a long delay is low, but you are cutting it fine to check in for a 21:00 flight. There is a National Express bus at 17:30, that gets to the airport at 20:30. This looks like it would be too late to rely on, but gives an idea of the driving time that they can regularly schedule. A taxi is almost certainly faster than the bus, due to flexibility over route, and not having to visit the intermediate stops (Stansted and other Heathrow terminals). It can also start as soon as you're ready, rather than waiting for the schedule. Google Maps predicts a time of 1:20 to 2:00 based on travel at 17:00 on a Wednesday. This fits with my limited experience. Not the answer you're looking for? Browse other questions tagged airport-transfer lhr cambridge or ask your own question. Fastest way to get from Heathrow Airport to Knightsbridge London? Long layover in London, time to visit Olympics? What it the fastest way, for four people plus luggage, to Heathrow T2 from King's Cross Station?